Where "non-traditional" is a good thing! 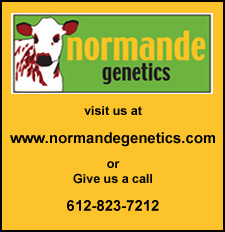 The Normande breed has its origin in cattle that were brought to Normandy by the Viking conquerors in the 9th and 10th centuries. For over a thousand years these cattle evolved into a dual purpose breed to meet the milk and meat needs of the residents of northwestern France. The present herd book in France was started in 1883. Though the breed was decimated by the Allied invasion of Normandy during World War II, there are currently 3 million Normandes in France. Their present role in France is to provide rich milk for the cheese industry while maintaining their excellent carcass quality. Normande milk components are the best for making cheese. Carcass yield and marbling are superior. 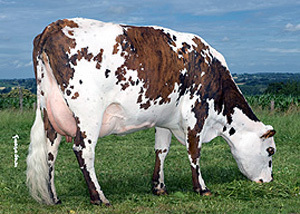 The Normande is the quintessential cow: unlike specialized breeds, it has preserved hardiness and breeding qualities, such as fertility, calving ease, feed and legs conformation, feed conversion and genetic diversity. The Normande demonstrates that milk production can be accomplished without losing essential breeding qualities. Normandes have been exported world-wide but have received their greatest acceptance in South America where they were introduced in the 1890's. The cattle have thrived there as one of the world's best dual purpose breeds. Total numbers there now exceed 4 million purebreds plus countless Normande crossbreds. Columbia alone has 1.6 million purebreds with the rest mainly in Brazil, Ecuador, Paraguay and Uruguay. They are a highly adaptable and hardy breed and have done well in beef operations in the Andes Mountains at elevations up to 13,000 feet. The Normande cow with her sound feet and legs can travel great distances over rough terrain to economically convert native roughages. Normande cows on high forage feeding systems average between 14,000 and 15,000 lbs of milk per lactation at 3.6 % protein and 4.4 % fat. Many cows produce more than 22,000 lbs and some reach 30,000 lbs. These results do not reflect the genetic originality of the breed: more than 90 % of the individuals carry the B Kappa Casein gene and 82 % of AI Bulls have the BB Genotype. The levels of casein beta and kappa in the milk are known to improve the curdling quality of the milk for cheese manufacturing (speed and firmness of gel). In addition, Normande milk presents favorable calcium/phosphate ratio and casein miscella of small diameter, all of which result in yields of cheese 15 to 20 % higher depending on the type of fabrication/manufacture. In France, the Normande is associated with the production of such famous cheeses as Camembert, Pont-Lévêque and Livarot. As today's dairy industry and market trends strongly favor and focus on cheese manufacturing, one can see the immediate benefit of having Normande milk in the tank. From Vermont to California and Wisconsin to Texas, dairy farmers are increasingly deciding to cross the top French Normande bulls with their dairy cows. Beyond hybrid vigor, they hope to make up for the lost breeding qualities (especially fertility and strength) fo such specialized breeds as Holstein and Jersey. Conventional dairymen and graziers alike, all seek maximum heterosis effect. Many of them intend to breed up to purebred, thus opting for a more functional, low maintenance cow. Studies made in France have shown that the F1 crosses tend to be above median average of the two breeds for milk but closer to the Normande for components. Further studies are needed to confirm this observation. But as inbreeding is becoming more of an issue for U.S. dairy breeds, there is great future for crossbreeding in the dairy industry. 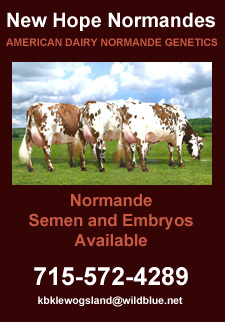 Because of its combination of strength, fertility and components, the Normande is well positioned to play a major role. Copyright © 2013 - 2016 Composite Dairy Cattle Registry. All rights reserved.